The badassBox removes the 25 km/h speed limitation from your eBike. NO WIRING OR ENGINE COVER REMOVAL REQUIRED - JUST PLUG THE BOX ON THE SPEED SENDOR AND YOU ARE READY TO GO!! badassBox 4 for KALKHOFF - Impulse 1, 2, and EVO. badassBox 4 for BROSE engine systems. This tuning takes away the 25 km/h speed limitation from your eBike. 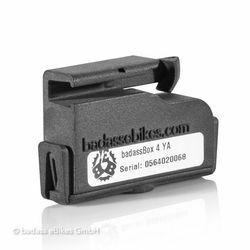 The badassBox 4 is the latest version of the proven badassBox for Bikes. · Contactless e-bike tuning for an easy fit (does not require rewiring/opening the engine). · Improved casing: slimmer, snap-lock for easy mounting-dismounting, auto industry casting compound for increased impermeability. · AAA battery that last more than 7,000 km. · Patented field enhanced technology. · The box undergoes several test before leaving the factory. Easy assemblage: just simply plug the box on the speed sensor (on the swing arm) and re-adjust the spoke magnet. Easy to remove: just remove the box and the magnet. The assemblage/removal of the box takes few seconds. The AAA battery can be easily replaced and no tools are required. The badassBox halves the speed sensor signal to approx.19 km/h and allows the engine to unleash its unrestricted speed. There is no interference with the engine electronics or the engine software. When the badassBox 4 is connected the display on the bike will show an incorrect speed. When the badassBox is removed the bike gets back to its original riding characteristics. The badassBox is not to be used in normal road traffic or in areas regulated by the Road Traffic Act.